I hope you all had a wonderful weekend! Today's look is all about being cozy and comfy, without sacrificing style. The easiest way to ensure that you'll look stylish while keeping warm is to layer, layer and layer some more! I've been experiencing a springtime itch because I'm so done with the cold and it just may be due to the fact that we almost got away without having a full on winter, but then February came and she made a huge debut. This dress is fairly thin and more ideal for spring and early summer, so to get away with wearing it now, I need to layer. Plus, I have to admit, this dress isn't the most flattering on me without the addition of the other pieces. Without layering it somehow, it just doesn't work for my pear shape at all; I'm widest at the hips and the neckline for this dress does't help to visually widen out my chest area, especially with the very small pattern, which makes the bust appear that much more smaller, so I need to add dimension on top to help balance out my proportions. 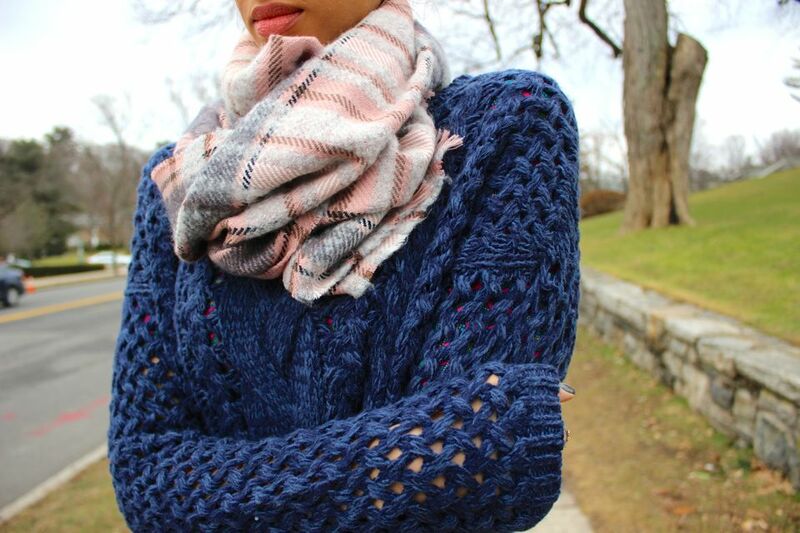 I added this blue cable knit sweater on top with a plaid scarf for warmth and to add a bit of a pattern mix effect. The over the knee boots help to keep my legs warm and I'm wearing Spanx underneath because we want everything to stay where it belongs, right?! This dress moves with my body, literally. I hope you found this post helpful! Thanks so much for stopping by and I hope you have an amazing week ahead, my dear friends!